Fallen arches are a common foot problem that is also known as flat feet. Fallen arches develop when the posterior tibial tendon, which is the main tendon supporting the arch of the foot, becomes weakened and collapses. This causes changes to the shape of the foot and usually results in pain and discomfort. Flat feet are often a result of genetics, but can also be due to obesity or to wearing unsupportive footwear. If you have a family history of fallen arches, it’s particularly important to pay attention to your feet in order to avoid this problem. 1. Be aware. Recognising the symptoms of flat feet can enable quick diagnosis and prevent further problems from developing. It’s important, especially if you have a family history of the condition, to get checked out if you experience sharp, burning throughout your arch and into the heel area. You may also feel pain in your calves, knees or lower back, swollen ankles and problems with standing on tiptoes or running and jumping. 2. Look after yourself. Obesity is a major risk factor for fallen arches, as it puts strain on the bones, ligaments and tendons of your feet. Ensuring that you take regular exercise, raising your heart rate for 30 minutes, five times per week, and eating a healthy, balanced diet can prevent many health problems, including problems with your feet. 3. Wear good shoes. Good shoes provide essential support for your feet, especially when you are walking or standing on hard surfaces for long periods of time. A professional shoe store such as Foot Solutions can help you to find the best footwear for you and your lifestyle, to give your feet proper support and keep foot problems at bay. 4. Look after your feet. Giving your feet a little TLC is very important to prevent foot problems such as fallen arches. You can help to restore tired, painful feet by soaking them in warm water, and adding Epsom salts can help the muscles to relax and promote healing. Alternatively, if your feet are especially swollen, you could try bathing them in iced water to ease inflammation. Foot massage can also be very helpful, and rolling your foot over a tennis ball or iced bottle can be a good way to do this. 5. 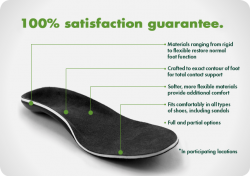 Try an orthotic insert. Orthotic inserts, or Custom Arch Supports are very useful in providing the support your feet need to avoid fallen arches. They compensate for the inward roll of feet that may be prone to problems, and custom devices are especially useful since they are made to fit your feet exactly. 6. Consult the professionals. Visiting a podiatrist or physiotherapist can be useful in treating fallen arches, as they may be able to help with the pain, or provide exercises or tips that will help to improve the condition of the feet and prevent further damage. If you’re worried about fallen arches, or you have a family history of flat feet, it’s important to take care of your feet to prevent problems developing. 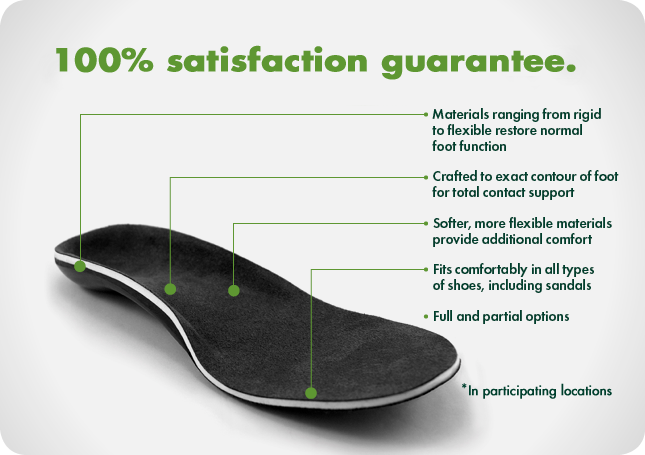 Visit Foot Solutions today for a free gait analysis and find footwear & arch supports that will work for you and your lifestyle.